American Blackbelly sheep are a composite breed resulting from the crossing of Barbados Blackbelly with Mouflon and Rambouillet breeds. As the name implies, the underbelly of the American Blackbelly is black, as is the inside of the legs, the back part of the thighs, and the hair inside the ears. Two black facial barbs extend down the muzzle medial to the eye, giving the breed an exotic appearance. Through selective breeding, the American Blackbelly has retained the coloration of its Barbados Blackbelly parent stock, but can be easily distinguished by the presence of horns on the rams. It is harder to identify which breed a ewe represents because American Blackbelly females may be polled, scurred, or horned, with the majority being polled. 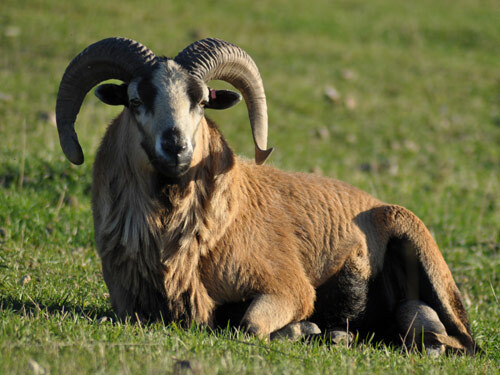 Because this sheep is popular with the trophy hunting markets, "trophy racks" are heavily selected for in American Blackbelly breeding stock. American Blackbelly are hair sheep, although in some areas of the U.S., American Blackbelly may develop a winter undercoat of fine wool fiber that is shed in the spring. American Blackbellies are known for their vitality, thrift, easy lambing, and lean carcass.